A CD of the chants that are sung at centers of the Vedanta Society of Southern California. Includes four hymns sung at Ramakrishna centers throughout the world and five devotional hymns. 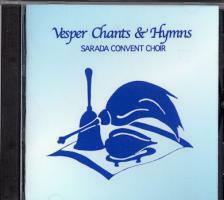 The vesper hymns are sung by nuns at our Santa Barbara convent and temple. For the words and music for the CD, you can download this PDF file. Listening to the singing in the evening is a great way to get your mind in the mood to meditate.